California sea lions (Zalophus californianus), members of the family Otariidae. A West Indian manatee (Trichechus manatus), a member of order Sirenia. A common minke whale (Balaenoptera acutorostrata), a member of the order Cetartiodactyla. The taxa in bold are marine. Marine mammals form a diverse group of 129 species that rely on the ocean for their existence. They do not represent a distinct taxon or systematic grouping, but instead have a polyphyletic relationship. They are also unified by their reliance on the marine environment for feeding. Despite the diversity in morphology seen between groups, improved foraging efficiency has been the main driver in their evolution. The level of dependence on the marine environment for existence varies considerably with species. For example, dolphins and whales are completely dependent on the marine environment for all stages of their life; seals feed in the ocean but breed on land; and polar bears must feed on land. Twenty three percent of marine mammal species are threatened. The cetaceans became aquatic around 50 million years ago (mya). Based on molecular and morphological research, the cetaceans genetically and morphologically fall firmly within the Artiodactyla (even-toed ungulates). The term "Cetartiodactyla" reflects the idea that whales evolved within the ungulates. The term was coined by merging the name for the two orders, Cetacea and Artiodactyla, into a single word. Under this definition, the closest living land relative of the whales and dolphins is thought to be the hippopotamuses. Sirenians, the sea cows, became aquatic around 40 million years ago. The first appearance of sirenians in the fossil record was during the early Eocene, and by the late Eocene, sirenians had significantly diversified. Inhabitants of rivers, estuaries, and nearshore marine waters, they were able to spread rapidly. The most primitive sirenian, †Prorastomus, was found in Jamaica, unlike other marine mammals which originated from the Old World (such as cetaceans). The first known quadrupedal sirenian was †Pezosiren from the early Eocene. The earliest known sea cows, of the families †Prorastomidae and †Protosirenidae, were both confined to the Eocene, and were pig-sized, four-legged, amphibious creatures. The first members of Dugongidae appeared by the end of the Eocene. At this point, sea cows were fully aquatic. Pinnipeds split from other caniforms 50 mya during the Eocene. Their evolutionary link to terrestrial mammals was unknown until the 2007 discovery of †Puijila darwini in early Miocene deposits in Nunavut, Canada. Like a modern otter, †Puijila had a long tail, short limbs and webbed feet instead of flippers. The lineages of Otariidae (eared seals) and Odobenidae (walrus) split almost 28 mya. Phocids (earless seals) are known to have existed for at least 15 mya, and molecular evidence supports a divergence of the Monachinae (monk seals) and Phocinae lineages 22 mya. Fossil evidence indicates the sea otter (Enhydra) lineage became isolated in the North Pacific approximately two mya, giving rise to the now-extinct †Enhydra macrodonta and the modern sea otter, Enhydra lutris. 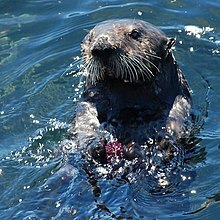 The sea otter evolved initially in northern Hokkaidō and Russia, and then spread east to the Aleutian Islands, mainland Alaska, and down the North American coast. In comparison to cetaceans, sirenians, and pinnipeds, which entered the water approximately 50, 40, and 20 mya, respectively, the sea otter is a relative newcomer to marine life. In some respects though, the sea otter is more fully adapted to water than pinnipeds, which must haul out on land or ice to give birth. Polar bears are thought to have diverged from a population of brown bears, Ursus arctos, that became isolated during a period of glaciation in the Pleistocene or from the eastern part of Siberia, (from Kamchatka and the Kolym Peninsula). The oldest known polar bear fossil is a 130,000 to 110,000-year-old jaw bone, found on Prince Charles Foreland in 2004. The mitochondrial DNA (mtDNA) of the polar bear diverged from the brown bear roughly 150,000 years ago. Further, some clades of brown bear, as assessed by their mtDNA, are more closely related to polar bears than to other brown bears, meaning that the polar bear might not be considered a species under some species concepts. In general, terrestrial amniote invasions of the sea have become more frequent in the Cenozoic than they were in the Mesozoic. Factors contributing to this trend include the increasing productivity of near-shore marine environments, and the role of endothermy in facilitating this transition. Marine mammals are widely distributed throughout the globe, but their distribution is patchy and coincides with the productivity of the oceans. Species richness peaks at around 40° latitude, both north and south. This corresponds to the highest levels of primary production around North and South America, Africa, Asia and Australia. Total species range is highly variable for marine mammal species. On average most marine mammals have ranges which are equivalent or smaller than one-fifth of the Indian Ocean. The variation observed in range size is a result of the different ecological requirements of each species and their ability to cope with a broad range of environmental conditions. The high degree of overlap between marine mammal species richness and areas of human impact on the environment is of concern. Most marine mammals, such as seals and sea otters, inhabit the coast. Seals, however, also use a number of terrestrial habitats, both continental and island. In temperate and tropical areas, they haul-out on to sandy and pebble beaches, rocky shores, shoals, mud flats, tide pools and in sea caves. Some species also rest on man-made structures, like piers, jetties, buoys and oil platforms. Seals may move further inland and rest in sand dunes or vegetation, and may even climb cliffs. :96 Most cetaceans live in the open ocean, and species like the sperm whale may dive to depths of −1,000 to −2,500 feet (−300 to −760 m) in search of food. Sirenians live in shallow coastal waters, usually living 30 feet (9.1 m) below sea level. However, they have been known to dive to −120 feet (−37 m) to forage deep-water seagrasses. Sea otters live in protected areas, such as rocky shores, kelp forests, and barrier reefs, although they may reside among drift ice or in sandy, muddy, or silty areas. Many marine mammals seasonally migrate. Annual ice contains areas of water that appear and disappear throughout the year as the weather changes, and seals migrate in response to these changes. In turn, polar bears must follow their prey. In Hudson Bay, James Bay, and some other areas, the ice melts completely each summer (an event often referred to as "ice-floe breakup"), forcing polar bears to go onto land and wait through the months until the next freeze-up. In the Chukchi and Beaufort seas, polar bears retreat each summer to the ice further north that remains frozen year-round. Seals may also migrate to other environmental changes, such as El Niño, and traveling seals may use various features of their environment to reach their destination including geomagnetic fields, water and wind currents, the position of the sun and moon and the taste and temperature of the water. :256–257 Baleen whales famously migrate very long distances into tropical waters to give birth and raise young, possibly to prevent predation by killer whales. The gray whale has the longest recorded migration of any mammal, with one traveling 14,000 miles (23,000 km) from the Sea of Okhotsk to the Baja Peninsula. During the winter, manatees living at the northern end of their range migrate to warmer waters. Marine mammals have a number of physiological and anatomical features to overcome the unique challenges associated with aquatic living. Some of these features are very species-specific. Marine mammals have developed a number of features for efficient locomotion such as torpedo-shaped bodies to reduce drag; modified limbs for propulsion and steering; tail flukes and dorsal fins for propulsion and balance. Marine mammals are adept at thermoregulation using dense fur or blubber, circulatory adjustments (counter-current heat exchangers); torpedo-shaped bodies, reduced appendages, and large size to prevent heat loss. Marine mammals are able to dive for long periods of time. Both pinnipeds and cetaceans have large and complex blood vessel systems which serve to store oxygen to support deep diving. Other important reservoirs include muscles, blood, and the spleen which all have the capacity to hold a high concentration of oxygen. They are also capable of bradycardia (reduced heart rate), and vasoconstriction (shunting most of the oxygen to vital organs such as the brain and heart) to allow extended diving times and cope with oxygen deprivation. If oxygen is depleted, marine mammals can access substantial reservoirs of glycogen that support anaerobic glycolysis of the cells involved during conditions of systemic hypoxia associated with prolonged submersion. Marine mammals have evolved a wide variety of features for feeding, which are mainly seen in their dentition. For example, the cheek teeth of pinnipeds and odontocetes are specifically adapted to capture fish and squid. In contrast, baleen whales have evolved baleen plates to filter feed plankton and small fish from the water. Polar bears, otters, and fur seals have long, oily, and waterproof fur in order to trap air to provide insulation. In contrast, other marine mammals–such as whales, dolphins, porpoises, manatees, dugongs, and walruses–have lost long fur in favor of a thick, dense epidermis and a thickened fat layer (blubber) to prevent drag. Wading and bottom-feeding animals (such as manatees) need to be heavier than water in order to keep contact with the floor or to stay submerged. Surface-living animals (such as sea otters) need the opposite, and free-swimming animals living in open waters (such as dolphins) need to be neutrally buoyant in order to be able to swim up and down the water column. Typically, thick and dense bone is found in bottom feeders and low bone density is associated with mammals living in deep water. Some marine mammals, such as polar bears and otters, have retained four weight-bearing limbs and can walk on land like fully terrestrial animals. All cetaceans are carnivorous and predatory. Toothed whales mostly feed on fish and cephalopods, followed by crustaceans and bivalves. Some may forage with other kinds of animals, such as other species of whales or certain species of pinnipeds. :169 One common feeding method is herding, where a pod squeezes a school of fish into a small volume, known as a bait ball. Individual members then take turns plowing through the ball, feeding on the stunned fish. Coralling is a method where dolphins chase fish into shallow water to catch them more easily. Killer whales and bottlenose dolphins have also been known to drive their prey onto a beach to feed on it. Killer whales have been known to have paralyzed great white sharks and other sharks and rays by flipping it upside down. Other whales with a blunt snout and reduced dentition rely on suction feeding. Though carnivorous, they house gut flora similar to that of terrestrial herbivores, probably a remnant of their herbivorous ancestry. Baleen whales use their baleen plates to sieve plankton, among others, out of the water; there are two types of methods: lunge-feeding and gulp-feeding. Lunge-feeders expand the volume of their jaw to a volume bigger than the original volume of the whale itself by inflating their mouth. This causes grooves on their throat to expand, increasing the amount of water the mouth can store. They ram a baitball at high speeds in order to feed, but this is only energy-effective when used against a large baitball. Gulp-feeders swim with an open mouth, filling it with water and prey. Prey must occur in sufficient numbers to trigger the whale's interest, be within a certain size range so that the baleen plates can filter it, and be slow enough so that it cannot escape. Sea otters have dexterous hands which they use to smash sea urchins off rocks. Otters are the only marine animals that are capable of lifting and turning over rocks, which they often do with their front paws when searching for prey. The sea otter may pluck snails and other organisms from kelp and dig deep into underwater mud for clams. It is the only marine mammal that catches fish with its forepaws rather than with its teeth. Under each foreleg, sea otters have a loose pouch of skin that extends across the chest which they use to store collected food to bring to the surface. This pouch also holds a rock that is used to break open shellfish and clams, an example of tool use. The sea otters eat while floating on their backs, using their forepaws to tear food apart and bring to their mouths. Marine otters mainly feed on crustaceans and fish. The polar bear is the most carnivorous species of bear, and its diet primarily consists of ringed (Pusa hispida) and bearded (Erignathus barbatus) seals. Polar bears hunt primarily at the interface between ice, water, and air; they only rarely catch seals on land or in open water. The polar bear's most common hunting method is still-hunting: The bear locates a seal breathing hole using its sense of smell, and crouches nearby for a seal to appear. When the seal exhales, the bear smells its breath, reaches into the hole with a forepaw, and drags it out onto the ice. The polar bear also hunts by stalking seals resting on the ice. Upon spotting a seal, it walks to within 100 yards (90 m), and then crouches. If the seal does not notice, the bear creeps to within 30 to 40 feet (9 to 10 m) of the seal and then suddenly rushes to attack. A third hunting method is to raid the birth lairs that female seals create in the snow. They may also feed on fish. Sirenians are referred to as "sea cows" because their diet consists mainly of sea-grass. When eating, they ingest the whole plant, including the roots, although when this is impossible they feed on just the leaves. A wide variety of seagrass has been found in dugong stomach contents, and evidence exists they will eat algae when seagrass is scarce. West Indian manatees eat up to 60 different species of plants, as well as fish and small invertebrates to a lesser extent. Sea otters are a classic example of a keystone species; their presence affects the ecosystem more profoundly than their size and numbers would suggest. They keep the population of certain benthic (sea floor) herbivores, particularly sea urchins, in check. Sea urchins graze on the lower stems of kelp, causing the kelp to drift away and die. Loss of the habitat and nutrients provided by kelp forests leads to profound cascade effects on the marine ecosystem. North Pacific areas that do not have sea otters often turn into urchin barrens, with abundant sea urchins and no kelp forest. 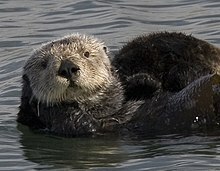 Reintroduction of sea otters to British Columbia has led to a dramatic improvement in the health of coastal ecosystems, and similar changes have been observed as sea otter populations recovered in the Aleutian and Commander Islands and the Big Sur coast of California However, some kelp forest ecosystems in California have also thrived without sea otters, with sea urchin populations apparently controlled by other factors. The role of sea otters in maintaining kelp forests has been observed to be more important in areas of open coast than in more protected bays and estuaries. An apex predator affects prey population dynamics and defense tactics (such as camouflage). The polar bear is the apex predator within its range. Several animal species, particularly Arctic foxes (Vulpes lagopus) and glaucous gulls (Larus hyperboreus), routinely scavenge polar bear kills. The relationship between ringed seals and polar bears is so close that the abundance of ringed seals in some areas appears to regulate the density of polar bears, while polar bear predation in turn regulates density and reproductive success of ringed seals. The evolutionary pressure of polar bear predation on seals probably accounts for some significant differences between Arctic and Antarctic seals. Compared to the Antarctic, where there is no major surface predator, Arctic seals use more breathing holes per individual, appear more restless when hauled out on the ice, and rarely defecate on the ice. The fur of Arctic pups is white, presumably to provide camouflage from predators, whereas Antarctic pups all have dark fur. Killer whales are apex predators throughout their global distribution, and can have a profound effect on the behavior and population of prey species. Their diet is very broad and they can feed on many vertebrates in the ocean including salmon, rays, sharks (even white sharks), large baleen whales, and nearly 20 species of pinniped. The predation of whale calves may be responsible for annual whale migrations to calving grounds in more tropical waters, where the population of killer whales is much lower than in polar waters. Prior to whaling, it is thought that great whales were a major food source; however, after their sharp decline, killer whales have since expanded their diet, leading to the decline of smaller marine mammals. A decline in Aleutian Islands sea otter populations in the 1990s was controversially attributed by some scientists to killer whale predation, although with no direct evidence. The decline of sea otters followed a decline in harbor seal and Steller sea lion populations, the killer whale's preferred prey, which in turn may be substitutes for their original prey, now reduced by industrial whaling. A 2010 study considered whales to be a positive influence to the productivity of ocean fisheries, in what has been termed a "whale pump". Whales carry nutrients such as nitrogen from the depths back to the surface. This functions as an upward biological pump, reversing an earlier presumption that whales accelerate the loss of nutrients to the bottom. This nitrogen input in the Gulf of Maine is more than the input of all rivers combined emptying into the gulf, some 25,000 short tons (23,000 t) each year.Whales defecate at the ocean's surface; their excrement is important for fisheries because it is rich in iron and nitrogen. The whale feces are liquid and instead of sinking, they stay at the surface where phytoplankton feed off it. Upon death, whale carcasses fall to the deep ocean and provide a substantial habitat for marine life. Evidence of whale falls in present-day and fossil records shows that deep sea whale falls support a rich assemblage of creatures, with a global diversity of 407 species, comparable to other neritic biodiversity hotspots, such as cold seeps and hydrothermal vents. Deterioration of whale carcasses happens though a series of three stages. Initially, moving organisms, such as sharks and hagfish, scavenge soft tissue at a rapid rate over a period of months to as long as two years. This is followed by the colonization of bones and surrounding sediments (which contain organic matter) by enrichment opportunists, such as crustaceans and polychaetes, throughout a period of years. Finally, sulfophilic bacteria reduce the bones releasing hydrogen sulphide enabling the growth of chemoautotrophic organisms, which in turn, support other organisms such as mussels, clams, limpets, and sea snails. This stage may last for decades and supports a rich assemblage of species, averaging 185 species per site. Marine mammals were hunted by coastal aboriginal humans historically for food and other resources. These subsistence hunts still occur in Canada, Greenland, Indonesia, Russia, the United States, and several nations in the Caribbean. The effects of these are only localized, as hunting efforts were on a relatively small scale. Commercial hunting took this to a much greater scale and marine mammals were heavily exploited. This led to the extinction of the †Steller's sea cow (Hydrodamalis gigas), †sea mink (Neovison macrodon), †Japanese sea lion (Zalophus japonicus), and the †Caribbean monk seal (Neomonachus tropicalis). Today, populations of species that were historically hunted, such as blue whales (Balaenoptera musculus) and the North Pacific right whale (Eubalaena japonica), are much lower than their pre-whaling levels. Because whales generally have slow growth rates, are slow to reach sexual maturity, and have a low reproductive output, population recovery has been very slow. A number of whales are still subject to direct hunting, despite the 1986 moratorium ban on whaling set under the terms of the International Whaling Commission (IWC). There are only two nations remaining which sanction commercial whaling: Norway, where several hundred common minke whales are harvested each year; and Iceland, where quotas of 150 fin whales and 100 minke whales per year are set. Japan also harvests several hundred Antarctic and North Pacific minke whales each year, ostensibly for scientific research in accordance with the moratorium. However, the illegal trade of whale and dolphin meat is a significant market in Japan and some countries. The most profitable furs in the fur trade were those of sea otters, especially the northern sea otter which inhabited the coastal waters between the Columbia River to the south and Cook Inlet to the north. The fur of the Californian southern sea otter was less highly prized and thus less profitable. After the northern sea otter was hunted to local extinction, maritime fur traders shifted to California until the southern sea otter was likewise nearly extinct. The British and American maritime fur traders took their furs to the Chinese port of Guangzhou (Canton), where they worked within the established Canton System. Furs from Russian America were mostly sold to China via the Mongolian trading town of Kyakhta, which had been opened to Russian trade by the 1727 Treaty of Kyakhta. Commercial sealing was historically just as important as the whaling industry. Exploited species included harp seals, hooded seals, Caspian seals, elephant seals, walruses and all species of fur seal. The scale of seal harvesting decreased substantially after the 1960s, after the Canadian government reduced the length of the hunting season and implemented measures to protect adult females. Several species that were commercially exploited have rebounded in numbers; for example, Antarctic fur seals may be as numerous as they were prior to harvesting. The northern elephant seal was hunted to near extinction in the late 19th century, with only a small population remaining on Guadalupe Island. It has since recolonized much of its historic range, but has a population bottleneck. Conversely, the Mediterranean monk seal was extirpated from much of its former range, which stretched from the Mediterranean to the Black Sea and northwest Africa, and only remains in the northeastern Mediterranean and some parts of northwest Africa. Polar bears can be hunted for sport in Canada with a special permit and accompaniment by a local guide. This can be an important source of income for small communities, as guided hunts bring in more income than selling the polar bear hide on markets. The United States, Russia, Norway, Greenland, and Canada allow subsistence hunting, and Canada distributes hunting permits to indigenous communities. The selling of these permits is a main source of income for many of these communities. Their hides can be used for subsistence purposes, kept as hunting trophies, or can be bought in markets. By-catch is the incidental capture of non-target species in fisheries. Fixed and drift gill nets cause the highest mortality levels for both cetaceans and pinnipeds, however, entanglements in long lines, mid-water trawls, and both trap and pot lines are also common. Tuna seines are particularly problematic for entanglement by dolphins. By-catch affects all cetaceans, both small and big, in all habitat types. However, smaller cetaceans and pinnipeds are most vulnerable as their size means that escape once they are entangled is highly unlikely and they frequently drown. While larger cetaceans are capable of dragging nets with them, the nets sometimes remain tightly attached to the individual and can impede the animal from feeding sometimes leading to starvation. Abandoned or lost nets and lines cause mortality through ingestion or entanglement. Marine mammals also get entangled in aquaculture nets, however, these are rare events and not prevalent enough to impact populations. Vessel strikes cause death for a number of marine mammals, especially whales. In particular, fast commercial vessels such as container ships can cause major injuries or death when they collide with marine mammals. Collisions occur both with large commercial vessels and recreational boats and cause injury to whales or smaller cetaceans. The critically endangered North Atlantic right whale is particularly affected by vessel strikes. Tourism boats designed for whale and dolphin watching can also negatively impact on marine mammals by interfering with their natural behavior. The fishery industry not only threatens marine mammals through by-catch, but also through competition for food. Large scale fisheries have led to the depletion of fish stocks that are important prey species for marine mammals. Pinnipeds have been especially affected by the direct loss of food supplies and in some cases the harvesting of fish has led to food shortages or dietary deficiencies, starvation of young, and reduced recruitment into the population. As the fish stocks have been depleted, the competition between marine mammals and fisheries has sometimes led to conflict. Large-scale culling of populations of marine mammals by commercial fishers has been initiated in a number of areas in order to protect fish stocks for human consumption. Shellfish aquaculture takes up space so in effect creates competition for space. However, there is little direct competition for aquaculture shellfish harvest. On the other hand, marine mammals regularly take finfish from farms, which creates significant problems for marine farmers. While there are usually legal mechanisms designed to deter marine mammals, such as anti-predator nets or harassment devices, individuals are often illegally shot. Map from the U.S. Geological Survey shows projected changes in polar bear habitat from 2005 to 2095. Red areas indicate loss of optimal polar bear habitat; blue areas indicate gain. Habitat degradation is caused by a number of human activities. Marine mammals that live in coastal environments are most likely to be affected by habitat degradation and loss. Developments such as sewage marine outfalls, moorings, dredging, blasting, dumping, port construction, hydroelectric projects, and aquaculture both degrade the environment and take up valuable habitat. For example, extensive shellfish aquaculture takes up valuable space used by coastal marine mammals for important activities such as breeding, foraging and resting. Contaminants that are discharged into the marine environment accumulate in the bodies of marine mammals when they are stored unintentionally in their blubber along with energy. Contaminants that are found in the tissues of marine mammals include heavy metals, such as mercury and lead, but also organochlorides and polycyclic aromatic hydrocarbons. For example, these can cause disruptive effects on endocrine systems; impair the reproductive system, and lower the immune system of individuals, leading to a higher number of deaths. Other pollutants such as oil, plastic debris and sewage threaten the livelihood of marine mammals. Noise pollution from anthropogenic activities is another major concern for marine mammals. This is a problem because underwater noise pollution interferes with the abilities of some marine mammals to communicate, and locate both predators and prey. Underwater explosions are used for a variety of purposes including military activities, construction and oceanographic or geophysical research. They can cause injuries such as hemorrhaging of the lungs, and contusion and ulceration of the gastrointestinal tract. Underwater noise is generated from shipping, the oil and gas industry, research, and military use of sonar and oceanographic acoustic experimentation. Acoustic harassment devices and acoustic deterrent devices used by aquaculture facilities to scare away marine mammals emit loud and noxious underwater sounds. Two changes to the global atmosphere due to anthropogenic activity threaten marine mammals. The first is increases in ultraviolet radiation due to ozone depletion, and this mainly affects the Antarctic and other areas of the southern hemisphere. An increase in ultraviolet radiation has the capacity to decrease phytoplankton abundance, which forms the basis of the food chain in the ocean. The second effect of global climate change is global warming due to increased carbon dioxide levels in the atmosphere. Raised sea levels, sea temperature and changed currents are expected to affect marine mammals by altering the distribution of important prey species, and changing the suitability of breeding sites and migratory routes. The Arctic food chain would be disrupted by the near extinction or migration of polar bears. Arctic sea ice is the polar bear's habitat. It has been declining at a rate of 13% per decade because the temperature is rising at twice the rate of the rest of the world. By the year 2050, up to two-thirds of the world's polar bears may vanish if the sea ice continues to melt at its current rate. A study by evolutionary biologists at the University of Pittsburgh showed that the ancestors of many marine mammals stopped producing a certain enzyme that today protects against some neurotoxic chemicals called organophosphates, including those found in the widely used pesticides chlorpyrifos and diazinon. Marine mammals may be increasingly exposed to these compounds due to agricultural runoff reaching the world's oceans. The Act was updated on 1 January 2016 with a clause banning "the import of fish from fisheries that cannot prove they meet US standards for protecting marine mammals." The requirement to show that protection standards are met is hoped to compel countries exporting fish to the US to more strictly control their fisheries that no protected marine mammals are adversely affected by fishing. The 1979 Convention on the Conservation of Migratory Species of Wild Animals (CMS) is the only global organization that conserves a broad range of animals, of which includes marine mammals. Of the agreements made, three of them deal with the conservation of marine mammals: ACCOBAMS, ASCOBANS, and the Wadden Sea Agreement. In 1982, the United Nations Convention on the Law of the Sea (LOSC) adopted a pollution prevention approach to conservation, which many other conventions at the time also adopted. The Agreement on the Conservation of Cetaceans in the Black Sea, Mediterranean Sea and contiguous Atlantic area (ACCOBAMS), founded in 1996, specifically protects cetaceans in the Mediterranean area, and "maintains a favorable status", a direct action against whaling. There are 23 member states. The Agreement on the Conservation of Small Cetaceans of the Baltic and North Seas (ASCOBANS) was adopted alongside ACCOBAMS to establish a special protection area for Europe's increasingly threatened cetaceans. Other anti-whaling efforts include a ten-year moratorium in 1986 by the IWC on all whaling, and an environmental agreement (a type of international law) the International Convention for the Regulation of Whaling which controlled commercial, scientific, and subsistence whaling. The Agreement on the Conservation of Seals in the Wadden Sea, enforced in 1991, prohibits the killing or harassment of seals in the Wadden Sea, specifically targeting the harbor seal population. The 1973 Agreement on the Conservation of Polar Bears between Canada, Denmark (Greenland), Norway (Svalbard), the United States, and the Soviet Union outlawed the unregulated hunting of polar bears from aircraft and icebreakers, as well as protecting migration, feeding, and hibernation sites. Various non-governmental organizations participate in marine conservation activism, wherein they draw attention to and aid in various problems in marine conservation, such as pollution, whaling, bycatch, and so forth. Notable organizations include the Greenpeace who focus on overfishing and whaling among other things, and Sea Shepherd Conservation Society who are known for taking direct-action tactics to expose illegal activity. For thousands of years, indigenous peoples of the Arctic have depended on whale meat. The meat is harvested from legal, non-commercial hunts that occur twice a year in the spring and autumn. The meat is stored and eaten throughout the winter. The skin and blubber (muktuk) taken from the bowhead, beluga, or narwhal is also valued, and is eaten raw or cooked. Whaling has also been practiced in the Faroe Islands in the North Atlantic since about the time of the first Norse settlements on the islands. Around 1000 long-finned pilot whales are still killed annually, mainly during the summer. Today, dolphin meat is consumed in a small number of countries worldwide, which include Japan and Peru (where it is referred to as chancho marino, or "sea pork"). In some parts of the world, such as Taiji, Japan and the Faroe Islands, dolphins are traditionally considered food, and are killed in harpoon or drive hunts. There have been human health concerns associated with the consumption of dolphin meat in Japan after tests showed that dolphin meat contained high levels of methylmercury. There are no known cases of mercury poisoning as a result of consuming dolphin meat, though the government continues to monitor people in areas where dolphin meat consumption is high. The Japanese government recommends that children and pregnant women avoid eating dolphin meat on a regular basis. Similar concerns exist with the consumption of dolphin meat in the Faroe Islands, where prenatal exposure to methylmercury and PCBs primarily from the consumption of pilot whale meat has resulted in neuropsychological deficits amongst children. Ringed seals were once the main food staple for the Inuit. They are still an important food source for the people of Nunavut and are also hunted and eaten in Alaska. Seal meat is an important source of food for residents of small coastal communities. The seal blubber is used to make seal oil, which is marketed as a fish oil supplement. In 2001, two percent of Canada's raw seal oil was processed and sold in Canadian health stores. Various species of dolphins are kept in captivity. These small cetaceans are more often than not kept in theme parks and dolphinariums, such as SeaWorld. Bottlenose dolphins are the most common species of dolphin kept in dolphinariums as they are relatively easy to train and have a long lifespan in captivity. Hundreds of bottlenose dolphins live in captivity across the world, though exact numbers are hard to determine. The dolphin "smile" makes them popular attractions, as this is a welcoming facial expression in humans; however the smile is due to a lack of facial muscles and subsequent lack of facial expressions. Organizations such as World Animal Protection and the Whale and Dolphin Conservation campaign against the practice of keeping cetaceans, particularly killer whales, in captivity. In captivity, they often develop pathologies, such as the dorsal fin collapse seen in 60–90% of male killer whales. Captives have vastly reduced life expectancies, on average only living into their 20s. In the wild, females who survive infancy live 46 years on average, and up to 70–80 years in rare cases. Wild males who survive infancy live 31 years on average, and up to 50–60 years. Captivity usually bears little resemblance to wild habitat, and captive whales' social groups are foreign to those found in the wild. Captive life is also stressful due the requirement to perform circus tricks that are not part of wild killer whale behavior, as well as restricting pool size. Wild killer whales may travel up to 100 miles (160 km) in a day, and critics say the animals are too big and intelligent to be suitable for captivity. Captives occasionally act aggressively towards themselves, their tankmates, or humans, which critics say is a result of stress. Dolphins are often trained to do several anthropomorphic behaviors, including waving and kissing—behaviors wild dolphins would rarely do. The large size and playfulness of pinnipeds make them popular attractions. Some exhibits have rocky backgrounds with artificial haul-out sites and a pool, while others have pens with small rocky, elevated shelters where the animals can dive into their pools. More elaborate exhibits contain deep pools that can be viewed underwater with rock-mimicking cement as haul-out areas. The most common pinniped species kept in captivity is the California sea lion as it is abundant and easy to train. These animals are used to perform tricks and entertain visitors. Other species popularly kept in captivity include the grey seal and harbor seal. Larger animals like walruses and Steller sea lions are much less common. Pinnipeds are popular attractions because they are "disneyfied", and, consequently, people often anthropomorphize them with a curious, funny, or playful nature. Some organizations, such as the Humane Society of the United States and World Animal Protection, object to keeping pinnipeds and other marine mammals in captivity. They state that the exhibits could not be large enough to house animals that have evolved to be migratory, and a pool could never replace the size and biodiversity of the ocean. They also oppose using sea lions for entertainment, claiming the tricks performed are "exaggerated variations of their natural behaviors" and distract the audience from the animal's unnatural environment. Sea otters can do well in captivity, and are featured in over 40 public aquariums and zoos. The Seattle Aquarium became the first institution to raise sea otters from conception to adulthood with the birth of Tichuk in 1979, followed by three more pups in the early 1980s. In 2007, a YouTube video of two cute sea otters holding paws drew 1.5 million viewers in two weeks, and had over 20 million views as of January 2015[update]. Filmed five years previously at the Vancouver Aquarium, it was YouTube's most popular animal video at the time, although it has since been surpassed. Otters are often viewed as having a "happy family life", but this is an anthropomorphism. The oldest manatee in captivity was Snooty, at the South Florida Museum's Parker Manatee Aquarium in Bradenton, Florida. Born at the Miami Aquarium and Tackle Company on July 21, 1948, Snooty was one of the first recorded captive manatee births. He was raised entirely in captivity, and died at the age of 69. Manatees can also be viewed in a number of European zoos, such as the Tierpark in Berlin, the Nuremberg Zoo, in ZooParc de Beauval in France, and in the Aquarium of Genoa in Italy. The River Safari at Singapore features seven of them. 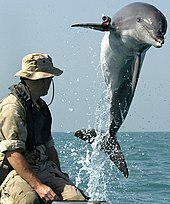 Bottlenose dolphins and California sea lions were used in the United States Navy Marine Mammal Program (NMMP) to detect mines, protect ships from enemy soldiers, and recover objects. The Navy has never trained attack dolphins, as they would not be able to discern allied soldiers from enemy soldiers. There were five marine mammal teams, each purposed for one of the three tasks: MK4 (dolphins), MK5 (sea lions), MK6 (dolphins and sea lions), MK7 (dolphins), and MK8 (dolphins); MK is short for mark. The dolphin teams were trained to detect and mark mines either attached to the seafloor or floating in the water column, because dolphins can use their echolocative abilities to detect mines. The sea lion team retrieved test equipment such as fake mines or bombs dropped from planes usually out of reach of divers who would have to make multiple dives. MK6 protects harbors and ships from enemy divers, and was operational in the Gulf War and Vietnam War. The dolphins would swim up behind enemy divers and attach a buoy to their air tank, so that they would float to the surface and alert nearby Navy personnel. Sea lions would hand-cuff the enemy, and try to outmaneuver their counter-attacks. The use of marine mammals by the Navy, even in accordance with the Navy's policy, continues to meet opposition. The Navy's policy says that only positive reinforcement is to be used while training the military dolphins, and that they be cared for in accordance with accepted standards in animal care. The inevitable stresses involved in training are topics of controversy, as their treatment is unlike the animals' natural lifestyle, especially towards their confined spaces when not training. There is also controversy over the use of muzzles and other inhibitors, which prevent the dolphins from foraging for food while working. The Navy states that this is to prevent them from ingesting harmful objects, but conservation activists say this is done to reinforce the trainers' control over the dolphins, who hand out food rewards. The means of transportation is also an issue for conservation activists, since they are hauled in dry carriers, and switching tanks and introducing the dolphin to new dolphins is potentially dangerous as they are territorial. ^ Jefferson, T. A.; Leatherwood, S.; Webber, M. A. (1994). Marine Mammals of the World. Food and Agriculture Department of the United Nations. pp. 1–2. ISBN 978-92-5-103292-3. OCLC 30643250. ^ a b c Perrin, William F.; Baker, C. Scott; Berta, Annalisa; Boness, Daryl J.; Brownell Jr., Robert L.; Domning, Daryl P.; Fordyce, R. Ewan; Srembaa, Angie; Jefferson, Thomas A.; Kinze, Carl; Mead, James G.; Oliveira, Larissa R.; Rice, Dale W.; Rosel, Patricia E.; Wang, John Y.; Yamada, Tadasu, eds. (2014). "The Society for Marine Mammalogy's Taxonomy Committee List of Species and subspecies" (PDF). Retrieved 25 June 2016. ^ Arroyo-Cabrales, J.; Ospina-Garces, S. (2016). "Myotis vivesi". IUCN Red List of Threatened Species. IUCN. 2016: e.T14209A22069146. doi:10.2305/IUCN.UK.2016-1.RLTS.T14209A22069146.en. ^ a b Kaschner, K.; Tittensor, D. P.; Ready, J.; Gerrodette, T.; Worm, B. (2011). "Current and Future Patterns of Global Marine Mammal Biodiversity". PLoS ONE. 6 (5): e19653. Bibcode:2011PLoSO...619653K. doi:10.1371/journal.pone.0019653. PMC 3100303. PMID 21625431. ^ Pompa, S.; Ehrlich, P. R.; Ceballos, G. (2011-08-16). "Global distribution and conservation of marine mammals". Proceedings of the National Academy of Sciences. 108 (33): 13600–13605. Bibcode:2011PNAS..10813600P. doi:10.1073/pnas.1101525108. PMC 3158205. PMID 21808012. ^ a b Jefferson, T. A.; Webber, M. A.; Pitman, R. L. (2009). Marine Mammals of the World A Comprehensive Guide to their Identification (1st ed.). London: Academic Press. pp. 7–16. ISBN 978-0-12-383853-7. OCLC 326418543. ^ Uhen, M. D. (2007). "Evolution of marine mammals: Back to the sea after 300 million years". The Anatomical Record. 290 (6): 514–22. doi:10.1002/ar.20545. PMID 17516441. ^ a b Savage, R. J. G.; Domning, Daryl P.; Thewissen, J. G. M. (1994). "Fossil Sirenia of the West Atlantic and Caribbean Region. V. the Most Primitive Known Sirenian, Prorastomus sirenoides Owen, 1855". Journal of Vertebrate Paleontology. 14 (3): 427–449. doi:10.1080/02724634.1994.10011569. JSTOR 4523580. ^ a b Schipper, J.; Chanson, J. S.; Chiozza, F.; Cox, N. A.; Hoffmann, M.; Katariya, V.; Lamoreux, J.; Rodrigues, A. S. L.; Stuart, S. N.; Temple, H. J.; Baillie, J.; Boitani, L.; Lacher, T. E.; Mittermeier, R. A.; Smith, A. T.; Absolon, D.; Aguiar, J. M.; Amori, G.; Bakkour, N.; Baldi, R.; Berridge, R. J.; Bielby, J.; Black, P. A.; Blanc, J. J.; Brooks, T. M.; Burton, J. A.; Butynski, T. M.; Catullo, G.; Chapman, R.; et al. (2008). "The Status of the World's Land and Marine Mammals: Diversity, Threat, and Knowledge" (PDF). Science. 322 (5899): 225–30. Bibcode:2008Sci...322..225S. doi:10.1126/science.1165115. hdl:1893/783. PMID 18845749. ^ Schipper, J.; Chanson, J. S.; Chiozza, F.; Cox, N. A. (2008). "The status of the world's land and marine mammals: diversity, threat, and knowledge". Science. 322 (5899): 225–230. Bibcode:2008Sci...322..225S. doi:10.1126/science.1165115. hdl:1893/783. PMID 18845749. ^ Castro, Peter; Huber, Michael E. (2007). Marine Biology (7th ed.). McGraw-Hill. p. 192. ISBN 978-0-07-302819-4. ^ Geisler, Jonathan H.; Uden, Mark D. (2005). "Phylogenetic Relationships of Extinct Cetartiodactyls: Results of Simultaneous Analyses of Molecular, Morphological, and Stratigraphic Data". Journal of Mammalian Evolution. 12 (1–2): 145–160. doi:10.1007/s10914-005-4963-8. ^ Graur, D.; Higgins, G. (1994). "Molecular evidence for the inclusion of cetaceans within the order Artiodactyla" (PDF). Molecular Biology and Evolution. 11 (3): 357–364. doi:10.1093/oxfordjournals.molbev.a040118. PMID 8015431. ^ Agnarsson, I.; May-Collado, LJ. (2008). "The phylogeny of Cetartiodactyla: the importance of dense taxon sampling, missing data, and the remarkable promise of cytochrome b to provide reliable species-level phylogenies". Molecular Phylogenetics and Evolution. 48 (3): 964–985. doi:10.1016/j.ympev.2008.05.046. PMID 18590827. ^ Price, SA. ; Bininda-Emonds, OR. ; Gittleman, JL. (2005). "A complete phylogeny of the whales, dolphins and even-toed hoofed mammals – Cetartiodactyla". Biological Reviews of the Cambridge Philosophical Society. 80 (3): 445–473. doi:10.1017/s1464793105006743. PMID 16094808. ^ Montgelard, C.; Catzeflis, FM. ; Douzery, E. (1997). "Phylogenetic relationships of artiodactyls and cetaceans as deduced from the comparison of cytochrome b and 12S RNA mitochondrial sequences". Molecular Biology and Evolution. 14 (5): 550–559. doi:10.1093/oxfordjournals.molbev.a025792. PMID 9159933. ^ Spaulding, M.; O'Leary, MA. ; Gatesy, J. (2009). "Relationships of Cetacea -Artiodactyla- Among Mammals: Increased Taxon Sampling Alters Interpretations of Key Fossils and Character Evolution". PLoS ONE. 4 (9): e7062. Bibcode:2009PLoSO...4.7062S. doi:10.1371/journal.pone.0007062. PMC 2740860. PMID 19774069. ^ Thewissen, J. G. M.; Bajpai, Sunil (2001). "Whale Origins as a Poster Child for Macroevolution". BioScience. 51 (12): 1037–1049. doi:10.1641/0006-3568(2001)051[1037:WOAAPC]2.0.CO;2. ^ Domning DP (2001). "The Earliest Known Fully Quadrupedal Sirenian". Nature. 413 (6856): 625–627. Bibcode:2001Natur.413..625D. doi:10.1038/35098072. PMID 11675784. ^ a b Prins, Herbert H. T.; Gordon, Iain J., eds. (2014). "The Biological Invasion of Sirenia into Australasia". Invasion Biology and Ecological Theory. Cambridge: Cambridge University Press. p. 123. ISBN 978-1-107-03581-2. OCLC 850909221. ^ Samonds, K. E.; Zalmout, I. S.; Irwin, M. T.; Krause, D. W.; Rogers, R. R.; Raharivony, L. L. (2009). "Eotheroides lambondrano, new Middle Eocene seacow (Mammalia, Sirenia) from the Mahajanga Basin, Northwestern Madagascar". Journal of Vertebrate Paleontology. 29 (4): 1233–1243. doi:10.1671/039.029.0417. ^ a b Arnason, U.; Gullberg, A.; Janke, A.; Kullberg, M.; Lehman, N.; Petrov, E. A.; Väinölä, R. (2006). "Pinniped phylogeny and a new hypothesis for their origin and dispersal". Molecular Phylogenetics and Evolution. 41 (2): 345–354. doi:10.1016/j.ympev.2006.05.022. PMID 16815048. ^ Perrin 2009, pp. 861–866. ^ Love, John A. (1992). Sea Otters. Golden, Colorado: Fulcrum Publishing. pp. 4–16. ISBN 978-1-55591-123-2. OCLC 25747993. ^ DeMaster, Douglas P.; Stirling, Ian (8 May 1981). "Ursus Maritimus". Mammalian Species. 145 (145): 1–7. doi:10.2307/3503828. JSTOR 3503828. ^ Kurtén, B (1964). "The evolution of the polar bear, Ursus maritimus Phipps". Acta Zoologica Fennica. 108: 1–30. ^ a b Lindqvist, C.; Schuster, S. C.; Sun, Y.; Talbot, S. L.; Qi, J.; Ratan, A.; Tomsho, L. P.; Kasson, L.; Zeyl, E.; Aars, J.; Miller, W.; Ingolfsson, O.; Bachmann, L.; Wiig, O. (2010). "Complete mitochondrial genome of a Pleistocene jawbone unveils the origin of polar bear". Proceedings of the National Academy of Sciences. 107 (11): 5053–57. Bibcode:2010PNAS..107.5053L. doi:10.1073/pnas.0914266107. PMC 2841953. PMID 20194737. ^ Waits, L. P.; Talbot, S. L.; Ward, R. H.; Shields, G. F. (2008). "Mitochondrial DNA Phylogeography of the North American Brown Bear and Implications for Conservation". Conservation Biology. 12 (2): 408–417. doi:10.1111/j.1523-1739.1998.96351.x. JSTOR 2387511. ^ Marris, E. (2007). "Linnaeus at 300: The species and the specious". Nature. 446 (7133): 250–253. Bibcode:2007Natur.446..250M. doi:10.1038/446250a. PMID 17361153. ^ Vermeij, G. J.; Motani, R. (2018). "Land to sea transitions in vertebrates: the dynamics of colonization". Paleobiology. 44 (2): 237–250. doi:10.1017/pab.2017.37. ^ Kaschner, K.; Tittensor, D. P.; Ready, J.; Gerrodette, T.; Worm, B. (2011). "Current and future patterns of global marine mammal biodiversity". PLoS ONE. 6 (5): e19653. Bibcode:2011PLoSO...619653K. doi:10.1371/journal.pone.0019653. PMC 3100303. PMID 21625431. ^ a b c d e f g h Berta, A; Sumich, J. L. (1999). "Exploitation and conservation". Marine Mammals: Evolutionary Biology. San Diego: Academic Press. ISBN 978-0-12-093225-2. OCLC 42467530. ^ a b c d e Riedman, M. (1990). The Pinnipeds: Seals, Sea Lions, and Walruses. Los Angeles: University of California Press. ISBN 978-0-520-06497-3. OCLC 19511610. ^ Whitehead, H. (2003). Sperm Whales: Social Evolution in the Ocean. Chicago: University of Chicago Press. p. 79. ISBN 978-0-226-89518-5. OCLC 51242162. ^ Marsh, H.; Eros, Carole; Hugues, Joanna; Penrose, Helen (2002). Dugong: status reports and action plans for countries and territories (PDF). International Union for Conservation of Nature. ISBN 978-92-807-2130-0. OCLC 51040880. ^ Silverstein, Alvin; Silverstein, Virginia; Silverstein, Robert (1995). The Sea Otter. Brookfield, Connecticut: The Millbrook Press, Inc. p. 19. ISBN 978-1-56294-418-6. OCLC 30436543. ^ Kenyon, Karl W. (1975). The Sea Otter in the Eastern Pacific Ocean. New York: Dover Publications. ISBN 978-0-486-21346-0. OCLC 1504461. ^ Stirling, Ian (1988). "Distribution and Abundance". Polar Bears. Ann Arbor: University of Michigan Press. ISBN 978-0-472-10100-9. ^ Lockyer, C. J. H.; Brown, S. G. (1981). "The Migration of Whales". In Aidley, D. Animal Migration. CUP Archive. p. 111. ISBN 978-0-521-23274-6. ^ a b Perrin 2009, p. 360. ^ Lee, Jane J. (2015). "A Gray Whale Breaks The Record For Longest Mammal Migration". National Geographic. Retrieved 23 January 2016. ^ Deutsch, C.J. ; Self-Sullivan, C. & Mignucci-Giannoni, A. (2008). "Trichechus manatus". The IUCN Red List of Threatened Species. 2008: e.T22103A9356917. doi:10.2305/IUCN.UK.2008.RLTS.T22103A9356917.en. Retrieved 23 December 2017. ^ Pfeiffer, Carl J. (1997). "Renal cellular and tissue specializations in the bottlenose dolphin (Tursiops truncatus) and beluga whale (Delphinapterus leucas)" (PDF). Aquatic Mammals. 23 (2): 75–84. Retrieved 2014-04-25. ^ Lockyer, Christina (1991). "Body composition of the sperm whale, Physeter cation, with special reference to the possible functions of fat depots" (PDF). Journal of the Marine Research Institute. 12 (2). ISSN 0484-9019. ^ Hochachka, P.; Storey, K. (1975). "Metabolic consequences of diving in animals and man". Science. 187 (4177): 613–621. Bibcode:1975Sci...187..613H. doi:10.1126/science.163485. ISSN 0036-8075. PMID 163485. ^ a b c d e f g Whitehead, H.; Reeves, R. R.; Tyack, P. L. (2000). "Science and the conversation, protection, and management of wild cetaceans". In Mann, J.; Connor, R. C. Cetacean societies : field studies of dolphins and whales. Chicago: University of Chicago Press. ISBN 978-0-226-50340-0. OCLC 42309843. ^ a b Cranford, T. W. (2000). "In Search of Impulse Sound Sources in Odontocetes". In Au, W. W. L.; Popper, A. N.; Fay, R. R. Hearing by Whales and Dolphins. Springer Handbook of Auditory Research. New York: Springer-Verlag. ISBN 978-1-4612-7024-9. OCLC 840278009. ^ Nummela, Sirpa; Thewissen, J.G.M; Bajpai, Sunil; Hussain, Taseer; Kumar, Kishor (2007). "Sound transmission in archaic and modern whales: Anatomical adaptations for underwater hearing". The Anatomical Record. 290 (6): 716–733. doi:10.1002/ar.20528. PMID 17516434. ^ Reidenberg, Joy S. (2007). "Anatomical Adaptations of Aquatic Mammals". The Anatomical Record. 290 (6): 507–513. doi:10.1002/ar.20541. OCLC 255630658. PMID 17516440. ^ Klinowska, Margaret; Cooke, Justin (1991). Dolphins, Porpoises, and Whales of the World: the IUCN Red Data Book (PDF). Columbia University Press, NY: IUCN Publications. ISBN 978-2-88032-936-5. OCLC 24110680. ^ a b Perrin 2009, pp. 570–572. ^ Gregory K. Silber, Dagmar Fertl (1995) – Intentional beaching by bottlenose dolphins (Tursiops truncatus) in the Colorado River Delta, Mexico. ^ Berta, A.; Sumich, J. L.; Kovacs, K. M. (2015). Marine Mammals: Evolutionary Biology. London: Academic Press. p. 430. ISBN 978-0-12-397002-2. OCLC 905649783. ^ Vogle, A. W.; Lillie, Margo A.; Piscitelli, Marina A.; Goldbogen, Jeremy A.; Pyenson, Nicholas D.; Shadwick, Robert E. (2015). "Stretchy nerves are an essential component of the extreme feeding mechanism of rorqual whales". Current Biology. 25 (9): 360–361. doi:10.1016/j.cub.2015.03.007. PMID 25942546. ^ Goldbogen, Jeremy A. (2010). "The Ultimate Mouthful: Lunge Feeding in Rorqual Whales". American Scientist. 98 (2): 124–131. doi:10.1511/2010.83.124. JSTOR 27859477. ^ Goldbogen, J. A.; Calambokidis, J.; Oleson, E.; Potvin, J.; Pyenson, N. D.; Schorr, G.; Shadwick, R. E. (2011). "Mechanics, hydrodynamics and energetics of blue whale lunge feeding: efficiency dependence on krill density". Journal of Experimental Biology. 214 (Pt 1): 131–146. doi:10.1242/jeb.048157. PMID 21147977. ^ Perrin 2009, pp. 806–813. ^ a b Reitherman, Bruce (Producer and photographer) (1993). Waddlers and Paddlers: A Sea Otter Story–Warm Hearts & Cold Water (Documentary). U.S.A.: PBS. ^ "Sea otter". BBC. Retrieved 2007-12-31. ^ a b c d e VanBlaricom, Glenn R. (2001). Sea Otters. Stillwater, MN: Voyageur Press Inc. pp. 22, 33, 69. ISBN 978-0-89658-562-1. OCLC 46393741. ^ Mangel, J. C.; Whitty, T.; Medina-Vogel, G.; Alfaro-Shigueto, J.; Cáceres, C.; Godley, B. J. (2010). "Latitudinal variation in diet and patterns of human interaction in the marine otter". Marine Mammal Science. 27 (2): 14–25. doi:10.1111/j.1748-7692.2010.00414.x. ^ Lavinge, D. M.; Kovacs, K. M.; Bonner, W. N. (2001). "Seals and Sea lions". In MacDonald, D. The Encyclopedia of Mammals (2nd ed.). Oxford University Press. pp. 147–55. ISBN 978-0-7607-1969-5. OCLC 48048972. ^ "Arctic Bears". PBS Nature. 17 February 2008. Archived from the original on 16 June 2008. ^ Amstrup, Steven C.; Marcot, Bruce G.; Douglas, David C. (2007). Forecasting the range-wide status of polar bears at selected times in the 21st Century (PDF). Reston, Virginia: U.S. Geological Survey. ^ a b Hemstock, Annie (1999). The Polar Bear. Manakato, MN: Capstone Press. pp. 24–27. ISBN 978-0-7368-0031-0. OCLC 38862448. ^ Matthews, Downs (1993). Polar Bear. San Francisco: Chronicle Books. ISBN 978-0-8118-0204-8. OCLC 488971350. ^ Dyck, M. G.; Romberg, S. (2007). "Observations of a wild polar bear (Ursus maritimus) successfully fishing Arctic charr (Salvelinus alpinus) and Fourhorn sculpin (Myoxocephalus quadricornis)". Polar Biology. 30 (12): 1625–1628. doi:10.1007/s00300-007-0338-3. ^ Marsh, Helene; O'Shea, Thomas J.; Reynolds III, John E. (2012). 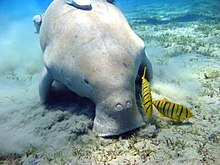 Ecology and Conservation of the Sirenia: Dugongs and Manatees. Cambridge: Cambridge University Press. p. 112. ISBN 978-0-521-88828-8. OCLC 773872519. ^ Marsh, Helene (1989). "Dugongidae". Fauna of Australia. 1. Canberra: Australian Government Public Service. ISBN 978-0-644-06056-1. OCLC 27492815. ^ Allen, Aarin Conrad; Keith, Edward O. (2015). "Using the West Indian Manatee (Trichechus manatus) as a Mechanism for Invasive Aquatic Plant Management in Florida". Journal of Aquatic Plant Management. 53: 95–104. ^ Estes, J. A.; Tinker, M. T.; Williams, T. M.; Doak, D. F. (1998). "Killer Whale Predation on Sea Otters Linking Oceanic and Nearshore Ecosystems". Science. 282 (5388): 473–476. Bibcode:1998Sci...282..473E. doi:10.1126/science.282.5388.473. ISSN 0036-8075. PMID 9774274. ^ "Aquatic Species at Risk – Species Profile – Sea Otter". Fisheries and Oceans Canada. Retrieved 29 November 2007. ^ Lepak, Jesse M.; Kraft, Clifford E., Weidel, Brian C. (March 2006). "Rapid food web recovery in response to removal of an introduced apex predator" (PDF). Canadian Journal of Fisheries and Aquatic Sciences 63 (3): 569–575. ISSN 0706-652X. ^ a b Lunn, Nicholas J.; Servanty, Sabrina; Regehr, Eric V.; Converse, Sarah J.; Richardson, Evan; Stirling, Ian (2016). "Demography of an apex predator at the edge of its range – impacts of changing sea ice on polar bears in Hudson Bay". Ecological Applications. 26 (5): 1302–1320. doi:10.1890/15-1256. PMID 27755745. ^ a b c Stirling, Ian; Guravich, Dan (1988). Polar Bears. Ann Arbor, MI: University of Michigan Press. pp. 27–28. ISBN 978-0-472-10100-9. OCLC 757032303. ^ Barre, Lynne M.; Norberg, J. B.; Wiles, Gary J. (2005). Conservation Plan for Southern Resident Killer Whales (Orcinus orca) (PDF). Seattle: National Marine Fisheries Service (NMFS) Northwest Regional Office. p. 18. Archived from the original (PDF) on 2008-06-26. ^ Pyle, Peter; Schramm, Mary Jane; Keiper, Carol; Anderson, Scot D. (1999). "Predation on a white shark (Carcharodon carcharias) by a killer whale (Orcinus orca) and a possible case of competitive displacement" (PDF). Marine Mammal Science. 15 (2): 563–568. doi:10.1111/j.1748-7692.1999.tb00822.x. ^ Visser, Ingrid N. (2005). "First Observations of Feeding on Thresher (Alopias vulpinus) and Hammerhead (Sphyrna zygaena) Sharks by Killer Whales (Orcinus orca) Specialising on Elasmobranch Prey". Aquatic Mammals. 31 (1): 83–88. doi:10.1578/AM.31.1.2005.83. ^ Ford, J. K. B.; Reeves, R. R. (2008). "Fight or flight: antipredator strategies of baleen whales". Mammal Review. 38 (1): 50–86. CiteSeerX 10.1.1.573.6671. doi:10.1111/j.1365-2907.2008.00118.x. ^ Heimlich, Sara; Boran, James (2001). Killer Whales. Stillwater, Minnesota: Voyageur Press. ISBN 978-0-89658-545-4. OCLC 46973039. ^ a b c Roman, J.; McCarthy, J. J. (2010). Roopnarine, Peter, ed. "The Whale Pump: Marine Mammals Enhance Primary Productivity in a Coastal Basin". PLoS ONE. 5 (10): e13255. Bibcode:2010PLoSO...513255R. doi:10.1371/journal.pone.0013255. PMC 2952594. PMID 20949007. ^ Roman, Joe; Estes, James A.; Morissette, Lyne; Smith, Craig; Costa, Daniel; McCarthy, James; Nation, J.B.; Nicol, Stephen; Pershing, Andrew; Smetacek, Victor (2014). "Whales as marine ecosystem engineers". Frontiers in Ecology and the Environment. 12 (7): 377–385. doi:10.1890/130220. ^ Smith, Craig R.; Baco, Amy R. (2003). "Ecology of Whale Falls at the Deep-Sea Floor" (PDF). Oceanography and Marine Biology: An Annual Review. 41: 311–354. ^ Fujiwara, Yoshihiro; Kawato, Masaru; Yamamoto, Tomoko; Yamanaka, Toshiro; Sato-Okoshi, Waka; Noda, Chikayo; Tsuchida, Shinji; Komai, Tomoyuki; Cubelio, Sherine S.; Sasaki, Takenori; Jacobsen, Karen; Kubokawa, Kaoru; Fujikura, Katsunori; Maruyama, Tadashi; Furushima, Yasuo; Okoshi, Kenji; Miyake, Hiroshi; Miyazaki, Masayuki; Nogi, Yuichi; Yatabe, Akiko; Okutani, Takashi (2007). "Three-year investigations into sperm whale-fall ecosystems in Japan". Marine Ecology. 28 (1): 219–230. Bibcode:2007MarEc..28..219F. doi:10.1111/j.1439-0485.2007.00150.x. ^ a b c d e f Clapham, P. J.; Young, S. B.; Brownell, R. L. (1999). "Baleen whales: Conservation issues and the status of the most endangered populations". Mammal Review. 29: 37–62. doi:10.1046/j.1365-2907.1999.00035.x. ^ "History of Whaling". The Húsavík Whale Museum. Archived from the original on 2009-06-21. Retrieved May 16, 2010. ^ "Modern Whaling". The Húsavík Whale Museum. Archived from the original on 2011-07-22. Retrieved May 16, 2010. ^ Baker, C. S.; Cipriano, F.; Palumbi, S. R. (1996). "Molecular genetic identification of whale and dolphin products from commercial markets in Korea and Japan". Molecular Ecology. 5 (5): 671–685. doi:10.1111/j.1365-294X.1996.tb00362.x. ^ Harrison, John (2008). "Fur trade". Northwest Power & Conservation Council. Retrieved 25 June 2016. ^ Haycox, Stephen W. (2002). Alaska: An American Colony. University of Washington Press. pp. 53–58. ISBN 978-0-295-98249-6. OCLC 49225731. ^ a b Riedman, M. (1990). The Pinnipeds: Seals, Sea Lions, and Walruses. San Francisco: University of California Press. ISBN 978-0-520-06497-3. OCLC 19511610. ^ Perrin 2009, pp. 585–588. ^ Beckman D. W. (2012). Marine Environmental Biology and Conservation. Jones & Bartlett Publishers. p. 315. ISBN 978-0-7637-7350-2. OCLC 613421445. ^ Johnson, W. M.; Karamanlidis, A. A.; Dendrinos, P.; de Larrinoa, P. F.; Gazo, M.; González, L. M.; Güçlüsoy, H.; Pires, R.; Schnellmann, M. "Monk Seal Fact Files". monachus-guardian.org. Retrieved September 9, 2013. ^ Wiig, Ø.; Amstrup, S.; Atwood, T.; Laidre, K.; Lunn, N.; Obbard, M.; Regehr, E. & Thiemann, G. (2015). "Ursus maritimus". The IUCN Red List of Threatened Species. 2015: e.T22823A14871490. doi:10.2305/IUCN.UK.2015-4.RLTS.T22823A14871490.en. Retrieved 23 December 2017. ^ "Overharvest". Polar Bears International. Retrieved 31 December 2016. ^ Hall, M. A. (1998). "An ecological view of the tuna—dolphin problem: impacts and trade-offs". Reviews in Fish Biology and Fisheries. 8: 1–34. doi:10.1023/A:1008854816580. ^ a b Anderson, Paul K. (2001). "Marine Mammals in the Next One Hundred Years: Twilight for a Pleistocene Megafauna?". Journal of Mammalogy. 82 (3): 623–629. doi:10.1093/jmammal/82.3.623. JSTOR 1383601. ^ a b c d e Wursig, Bernd; Gailey, Glenn A. (2002). "Marine Mammals and Aquaculture: Conflicts and Potential Resolutions". In Stickney, Robert R.; McVey, James P. Responsible marine aquaculture. Wallingford, Oxon; New York: CABI. ISBN 978-0-85199-604-2. OCLC 228169018. ^ Conn, P. B.; Silber, G. K. (2013). "Vessel speed restrictions reduce risk of collision-related mortality for North Atlantic right whales". Ecosphere. 4 (1): art43. doi:10.1890/ES13-00004.1. ^ Constantine, R.; Brunton, D. H.; Dennis, T. (2004). "Dolphin-watching tour boats change bottlenose dolphin (Tursiops truncatus) behaviour". Biological Conservation. 117 (3): 299–307. doi:10.1016/j.biocon.2003.12.009. ^ Rosen, D. A.; Trites, A. W. (2000). "Pollock and the decline of Steller sea lions: Testing the junk-food hypothesis". Canadian Journal of Zoology. 78 (7): 1243–1250. doi:10.1139/z00-060. ^ McAlpine, D. F.; Stevick, P. T.; Murison, L. D. (1999). "Increase in Extralimital Occurrences of Ice-Breeding Seals in the Northern Gulf of Maine Region: More Seals or Fewer Fish?". Marine Mammal Science. 15 (3): 906–911. doi:10.1111/j.1748-7692.1999.tb00857.x. ^ Hutchins, J. (1996). "Spatial and temporal variation in the density of northern cod and a review of hypotheses for the stock's collapse" (PDF). Canadian Journal of Fisheries and Aquatic Sciences. 53 (5): 943–962. doi:10.1139/cjfas-53-5-943. ^ Baker, J. R.; Jones, A. M.; Jones, T. P.; Watson, H. C. (1981). "Otter Lutra lutra L. Mortality and marine oil pollution". Biological Conservation. 20 (4): 311–321. doi:10.1016/0006-3207(81)90017-3. ^ Harwood, J. (2001). "Marine Mammals and their Environment in the Twenty-First Century". Journal of Mammalogy. 82 (3): 630–640. doi:10.1644/1545-1542(2001)082<0630:MMATEI>2.0.CO;2. JSTOR 1383602. ^ Madronich, S.; McKenzie, R. L.; Björn, L. O.; Caldwell, M. M. (1998). "Changes in biologically active ultraviolet radiation reaching the Earth's surface". Journal of Photochemistry and Photobiology B: Biology. 46 (1–3): 5–19. CiteSeerX 10.1.1.319.3101. doi:10.1016/S1011-1344(98)00182-1. ^ Simmonds, M. P.; Isaac, S. J. (2007). "The impacts of climate change on marine mammals: Early signs of significant problems". Oryx. 41: 19. doi:10.1017/S0030605307001524. ^ Stirling, Ian; Lunn, N. J.; Iacozza, J. (September 1999). "Long-term trends in the population ecology of polar bears in Western Hudson Bay in relation to climatic change" (PDF). Arctic. 52 (3): 294–306. doi:10.14430/arctic935. ^ Amstrup, S. C.; Marcot, B. G.; Douglas, D. C. (2008). DeWeaver, Eric L.; Bitz, Cecilia M.; Tremblay, L.-Bruno, eds. Arctic Sea Ice Decline: Observations, Projections, Mechanisms, and Implications: A Bayesian Network Modeling Approach to Forecasting the 21st Century Worldwide Status of Polar Bears (PDF). Arctic Sea Ice Decline: Observations. Arctic Sea Ice Decline: Observations, Projections, Mechanisms, and Implications. 180. pp. 213–268. Bibcode:2008GMS...180..213A. doi:10.1029/180GM14. ISBN 9781118666470. ^ "Marine Mammals Have Lost a Gene That Now They May Desperately Need". Retrieved 2018-08-13. ^ Meyer, Wynn K.; Jamison, Jerrica; Richter, Rebecca; Woods, Stacy E.; Partha, Raghavendran; Kowalczyk, Amanda; Kronk, Charles; Chikina, Maria; Bonde, Robert K.; Crocker, Daniel; Gaspard, Joseph; Lanyon, Janet; Marsillach, Judit; Furlong, Clement; Clark, Nathan (2018-08-10). "Ancient convergent losses of Paraoxonase 1 yield potential risks for modern marine mammals". Science. 361 (6402): 591–594. doi:10.1126/science.aap7714. ISSN 0036-8075. PMC 6317340. PMID 30093596. ^ Benson, Etienne (2010). Wired Wilderness: Technologies of Tracking and the Making of Modern Wildlife. Johns Hopkins University Press. p. 147. ISBN 978-0-8018-9710-8. OCLC 502874368. ^ a b c "Marine Mammal Protection Act of 1972". act of 2007 (PDF). pp. 1–113. Retrieved 20 August 2016. ^ a b "A new law will try to save the planet's whales and dolphins through America's seafood purchasing power". Quartz. Retrieved 2018-08-13. ^ "Convention on the Conservation of Migratory Species of Wild Animals" (PDF). 1979. Retrieved 7 September 2016. ^ "CMS". Convention on the Conservation of Migratory Species of Wild Animals. Retrieved 7 September 2016. ^ "Agreements". Convention on the Conservation of Migratory Species of Wild Animals. Retrieved 7 September 2016. ^ a b c Ora, Nilufer (2013). Regional Co-operation and Protection of the Marine Environment Under International Law. Leiden, Netherlands: Koninklijke Brill. pp. 131–137. ISBN 978-90-04-25085-7. ^ "List of Contracting Parties and Signatories" (PDF). ACCOBAMS. 2011. Retrieved 7 September 2016. ^ "Catch Limits and Catches Taken". International Whaling Commission. Retrieved 28 November 2016. ^ International Convention for the Regulation of Whaling (PDF). International Convention for the Regulation of Whaling. Washington, D. C. 1946. pp. 1–3. Archived from the original (PDF) on 7 April 2014. Retrieved 28 November 2016. ^ Braathen, Jonette N. (1998). International Co-operation on Fisheries and Environment. TemaNord. Copenhagen: Nordic Council of Ministers. p. 45. ISBN 978-92-893-0198-5. ^ "Agreement on the Conservation of Polar Bears". Oslo, Norway: IUCN/ Polar Bear Specialist Group. 1973. Retrieved 31 December 2016. ^ "Marine Conservation Organizations". MarineBio. Retrieved 28 November 2016. ^ "Native Alaskans say oil drilling threatens way of life". BBC News. July 2010. Retrieved 18 June 2016. ^ Lee, Jane J. (September 2014). "Faroe Island Whaling, a 1,000-Year Tradition, Comes Under Renewed Fire". National Geographic. Retrieved 18 June 2016. ^ a b Matsutani, Minoru (September 23, 2009). "Details on how Japan's dolphin catches work". Japan Times. p. 3. ^ a b Harnell, Boyd (2007). "Taiji officials: Dolphin meat 'toxic waste'". The Japan Times. Retrieved 24 June 2016. ^ a b c World Health Organization (2008). "Guidance for identifying populations at risk from mercury exposure" (PDF). p. 36. Retrieved 29 August 2013. ^ Ministry of Health, Labour and Welfare. "平成１５年６月３日に公表した「水銀を含有する魚介類等の 摂食に関する注意事項」について". Ministry of Health, Labour and Welfare (in Japanese). ^ "Eskimo Art, Inuit Art, Canadian Native Artwork, Canadian Aboriginal Artwork". Inuitarteskimoart.com. Archived from the original on 2013-05-30. Retrieved 7 May 2009. ^ Kets de Vries, F. R. (2014). Talking to the Shaman Within Musings on Hunting. iUniverse Inc. p. 358. ISBN 978-1-4917-3034-8. OCLC 881660311. ^ "5 Forslag til tiltak" (in Norwegian). Government of Norway. Retrieved 18 June 2016. ^ Rose, Naomi; Parsons, E. C. M.; Farinato, Richard. The Case Against Marine Mammals in Captivity (PDF) (4th ed.). Humane Society of the United States. pp. 13, 42, 43, 59. ^ White, Thomas (2007). In Defense of Dolphins: The New Moral Frontier. Malden, MA: Blackwell Publishing. p. 17. ISBN 978-1-4051-5779-7. OCLC 122974162. ^ Rose, N. A. (2011). "Killer Controversy: Why Orcas Should No Longer Be Kept in Captivity" (PDF). Humane Society International and the Humane Society of the United States. Retrieved 21 December 2014. ^ "Whale Attack Renews Captive Animal Debate". CBS News. March 1, 2010. Retrieved 6 September 2015. ^ Susan Jean Armstrong (2003). Animal Ethics Reader. ISBN 978-0-415-27589-7. OCLC 51818774. ^ Curtin, Susanna; Wilkes, Keith (2007). "Swimming with captive dolphins: current debates and post-experience dissonance" (PDF). International Journal of Tourism Research. 9 (2): 131–146. doi:10.1002/jtr.599. ^ a b Larson, S. (2001). "Seals and Sea lions". In Bell, C. E. Encyclopedia of the World's Zoos. 3. pp. 1148–1150. ISBN 978-1-57958-174-9. OCLC 42213993. ^ Nowak, R. M. (2003). Walker's Marine Mammals of the World. Johns Hopkins University Press. pp. 80–83. ISBN 978-0-8018-7343-0. OCLC 51087217. ^ Sigvaldadóttir, Sigurrós Björg (2012). "Seals as Humans—Ideas of Anthropomorphism and Disneyfication" (PDF). Selasetur Working Paper (107). Archived from the original (PDF) on 2016-09-15. ^ "The Case Against Marine Mammals in Captivity" (PDF). Humane Society of the United States and World Animal Protection. pp. 3, 18. Retrieved May 30, 2012. ^ "Seattle Aquarium's Youngest Sea Otter Lootas Becomes a Mom". Business Wire. April 19, 2000. Archived from the original on June 19, 2009. Retrieved 9 March 2007. ^ cynthiaholmes (19 March 2007). "Otters holding hands". YouTube. Retrieved 18 June 2016. ^ Sweeney, Susan; Craig, Randall (2011). Social Media for Business: 101 Ways to Grow Your Business Without Wasting Your Time. Gulf Breeze, Florida: Maximum Press. p. 86. ISBN 978-1-931644-91-4. OCLC 656846644. ^ Kruuk, Hans (2006). Otters: Ecology, Behaviour and Conservation. Oxford, New York: Oxford University Press. p. 90. ISBN 978-0-19-856586-4. OCLC 137241436. ^ Aronson, Claire. "Guinness World Records names Snooty of Bradenton as 'Oldest Manatee in Captivity'". bradenton.com. Bradenton Herald. Retrieved 26 June 2015. ^ Caldwell, Alicia (October 2001). "He's a captive of affection". St. Petersburg Times. Retrieved 18 June 2016. ^ Pitman, Craig (July 2008). "A manatee milestone: Snooty turning 60". Tampa Bay Times. Archived from the original on 6 June 2014. Retrieved 18 June 2016. ^ Meller, Katie (2017). "Snooty the famous manatee dies in 'heartbreaking accident' days after his 69th birthday". Washington Post. Retrieved 27 July 2017. ^ Blaszkiewitz, B. (1995). "Die Seekuhanlage im Tierpark Berlin-Friedrichsfelde". Zoologischer Garten (in German). 65: 175–181. ^ Mühling, P. (1985). "Zum ersten Mal: Drei Seekuhgeburten in einem Zoo. Erfolgreiche Haltung und Zucht von Rundschwanz-Seekühen (Trichechus manatus)". Tiergarten Aktuell (Nuremberg) (in German). 1 (1): 8–16. ^ "Extraordinary Animals: Manatees". Zooparc de Beauval. Retrieved 24 June 2016. ^ Eyewitness Travel Family Guide Italy: Milan & the Northwest Italy. New York: DK Publishing. 2012. ISBN 978-1-336-12080-8. OCLC 934043451. ^ "Manatees move into world's largest freshwater aquarium at River Safari". The Straits Times. Retrieved 18 June 2016. ^ a b Eglan, Jared (2015). Beasts of War: The Militarization of Animals. Lulu.com. pp. 126–128. ISBN 978-1-329-51613-7. ^ a b Kistler, John M. (2011). Animals in the Military: From Hannibal's Elephants to the Dolphins of the U.S. Navy. Santa Barbara, California: ABC-CLIO. pp. 313–321. ISBN 978-1-59884-346-0. OCLC 741119653. Perrin, W. F.; Wursig, B.; Thewissen, J. G. M. (2009). Encyclopedia of Marine Mammals (2nd ed.). San Diego: Academic Press. ISBN 978-0-0809-1993-5. OCLC 316226747. The Society for Marine Mammalogy The largest organization of marine mammalogists in the world.